1. The pig was fed and it vomits and aspirates (causing pneumonia). No food or water after midnight on the night before surgery. Do not put hay or shavings or anything like that in the transport kenne l(because a hungry pig may eat anything). Take your pigs normal food into the hospital when you go, just in case it needs to stay – so your veterinarian will have something to feed. a. ASK for pain medications. There are several good pain medications for use in pigs. NSAIDS and narcotics are the two commonclasses of pain medications used. Both are good. They can be used incombination. ASK for them. Also, they will NOT be included in the cost of surgery, so be prepared to pay for them. b. Exercise restriction to prevent injury is VERY IMPORTANT for 2 weeks…donot let your pig play with other pets or children. Keep it indoors or in its kennel/stall. Keep it clean, dry and warm. Try to avoid stairs and jumping. c. If your pig is trembling after surgery, this may be an after effect from anesthesia, but this can also be a result of your pig being in pain. Please be sure to follow pain control measures ordered by your vet after surgery. If no instructions were given, ask for pain control and instructions on what to do if you have a problem before you leave with your pig. b. Increase water consumption by your pig – mix ¼ apple, cranberry, orprune juice with ¾ water. OR mix ½ Gatorade with ½ water. Offer one of these water mixtures until your pig is eating well and pooping normally after surgery. Feed only soaked pellets for at least 1 week after surgery. c. Start feeding your pig small soft meals as soon as 6 hours after surgery– encourage them to eat by mixing soaked pellets with yogurt or pudding or applesauce (something to make the meal extra tasty). Feed several small meals per day rather that 1 or 2 large meals. e. A painful pig will not eat and will not do a good abdominal press to defecate – make sure it is not in pain. 4. Urination outside of the box– pain and an irregular bowel, plus increased water consumption may cause accidents for a week or two after surgery. The pig’s body will be confused about its eliminations. This is normal. Please restrict your pig to areas where the urine will not soil the rug or furniture. (There is an unwritten pig rule that says they will urinate on something white, valuable, antique, or un-washable). If the incision seems to be opening up, have your pig checked as soon as your veterinarian is open. If “inside things” seem to be coming out, have your pig checked by your veterinarian right away. (this is an emergency). a. The incision will be somewhat swollen and red. There may be bright red or purple bruising. The color of the bruise will change over a week or so, but it should fade over this time. If the incision gets more swollen, develops a discharge or odor, or if the bruising gets bigger, please have your pig checked by your veterinarian. b. Sutures – some veterinarians will put skin sutures or staples into the incision. These will need to be removed in about 14 days. c. Buried sutures – many veterinarian use buried dissolvable sutures that do not need to be removed. These actually take several weeks to dissolve. In some cases, a small bit of suture material may poke out of the skin, and the area around this pokie may look like a little pimple. If this happens, check it once a day until gone, but do not worry about it. It will eventually dissolve and fall off. Call your veterinarian and report the pokie, but you will probably not need to have it seen. 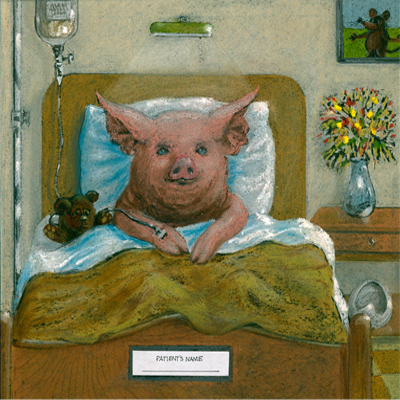 IF YOU HAVE ANY QUESTIONS ABOUT YOUR PIG AFTER SURGERY, CALL YOUR VETERINARIAN.